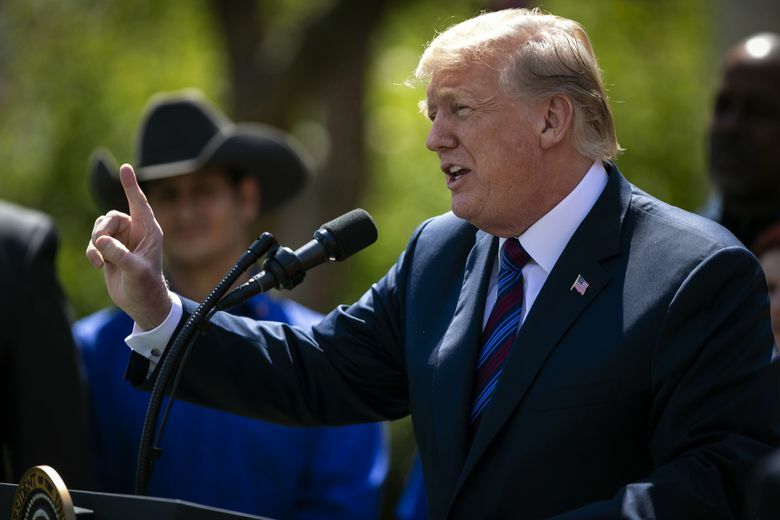 President Donald Trump speaks during an event on tax policy in the Rose Garden of the White House in Washington, D.C., on April 12, 2018. (Bloomberg photo by Al Drago). Donald Trump disclosed Monday that his campaign and affiliated committees have raised at least $106 million — an enormous sum that exceeds what any of his predecessors amassed so early in their presidencies. WASHINGTON — As Democrats get organized for the 2020 election, one major obstacle is becoming starkly clear: President Donald Trump’s $100 million head start. Trump, who began raising money for his reelection campaign shortly after winning the presidency, disclosed Monday that his campaign and affiliated committees have raised at least $106 million — an enormous sum that exceeds what any of his predecessors amassed so early in their presidencies. More than half of the money the committees raised in the most recent fundraising quarter came from individual supporters, who are giving in amounts of $200 or less. These supporters also are turning up at Trump-headlined rallies, where their information is being pulled into the Republican National Committee’s expanding voter database. The party is connecting with 1 million voters per day and forging an army of volunteers — with a test run of this machine underway in the form of the November midterm election. The expansive effort comes as Democrats’ hopes for the presidency are just coming into focus. The 2020 race is expected to begin almost immediately after the midterm election, and Sen. Elizabeth Warren of Massachusetts, Sen. Cory Booker of New Jersey and former vice president Joe Biden are among the high-profile Democrats who have recently raised millions of dollars and traveled around the country to support midterm candidates — moves typically considered signs of presidential aspirations. But the Trump machine has been churning for nearly two years — unheard of before this president, as his predecessors typically waited until after midterm elections to focus on their reelection campaigns. “If the Trump campaign and RNC keep doing what they’re doing, they’re going to amass a huge fundraising and grassroots network. By the time the conventions come around, they’re going to be rolling down the campaign trail with a well-oiled, fully-weaponized battle station,” said GOP strategist Scott Jennings, who advised Mitt Romney’s 2012 presidential campaign. The Democratic National Committee, struggling to rebuild after 2016, effectively has no cash on hand and remains in debt. DNC officials said they are cognizant of the gap they need to close for 2020 and are investing in state parties and cybersecurity so that the eventual nominee will inherit a strong party — something they acknowledge that Hillary Clinton did not have in 2016. “There’s no question that the DNC found itself in a deeper hole than they thought when the 2018 cycle started, and they have significant more work to do to get resources and to build infrastructure, so that when we have a nominee, we’re prepared to fight,” said Guy Cecil, chairman of Priorities USA, the main Democratic super PAC. Trump has a number of advantages when it comes to fundraising, the most powerful of which may be his appeal to different parts of the GOP base. The work of these groups is already evident. At least six political action committees have spent more than $9 million to promote Trump’s 2020 run, while spending only about $1.2 million supporting GOP House and Senate candidates, according to a McClatchy News analysis. The RNC now has 540 national staff members across 28 states, with more than 22,000 activists whom they describe as “top tier” because they are specifically trained to help sustain the operation. In comparison, 5,000 such volunteers were trained for the 2016 campaign. Republicans are hoping that their organized approach will fend off the anti-Trump wave. “When [Trump] announced his reelection campaign shortly after the inauguration, I think it was a brilliant move because it allowed us to keep running hand-in-hand with the campaign apparatus and the RNC for the midterms,” RNC political director JustonJohnson said. Trump’s Make America Great Again rallies supporting Republican midterm candidates have served a particularly useful purpose: recruiting volunteers for the RNC’s field operation and improving its data program, which is growing increasingly sophisticated as a result of the nearly $250 million that officials say they have spent since 2012 to improve the party’s data and digital operations. The RNC’s data program flags prospective volunteers when they express interest in the party for the first time — such as making a donation or signing a petition online — and then activates them when they seem most enthusiastic about the president, such as when they register to attend their first Trump rally. That’s how Hope Eck, 49, a registered nurse in Indiana, came to volunteer with the RNC. Eck, an independent who supported Clinton in 2008 and voted for Trump in 2016, attended her first Trump rally in May in Elkhart, Indiana. When Trump implored the crowd to help elect Republican Mike Braun to the Senate, in one of the most competitive contests this fall, “I definitely felt a tug at my heart to get involved,” Eck said. So at the rally, she signed up to volunteer. Within a week, a Republican Party official called her. Soon after, Eck was knocking on doors to educate voters about Braun. She now canvasses voters in person and by phone every day, often on her own. What Eck did not know when she started volunteering was that because she attended the rally, her name showed up in a database the party uses to recruit first-time rally attendees as volunteers while they are still fired up from the president’s visit. “I enjoy feeling like I’m making a difference,” Eck said. She also gives money online to enter contests to meet Trump and buys merchandise, making her one of the donors giving low-dollar contributions. Linda Olson, 66, a retired legal secretary who lives in Great Falls, Montana, attended a Trump rally for the first time in July after waiting 5 1/2 hours in line. Olson voted for Trump in 2016, but it wasn’t until she saw him in person at the rally that she was moved to volunteer for the party, urging voters to support Republicans in House and Senate races. Olson said she plans to continue volunteering to help Trump get reelected in 2020. “Anything he needs us to do — for the president — we’ll be doing,” she said.